I’m on a mission to go through every corner, closet, nook, cranny, and drawer of our house to clear the clutter and repurpose, recycle or get rid of of things we no longer need. T-shirts are my latest target (how do we have so many?!) and after repurposing G’s old tees by turning them into reusable disinfectant wipes, I wanted to do something equally productive for the planet with mine and Kate’s. 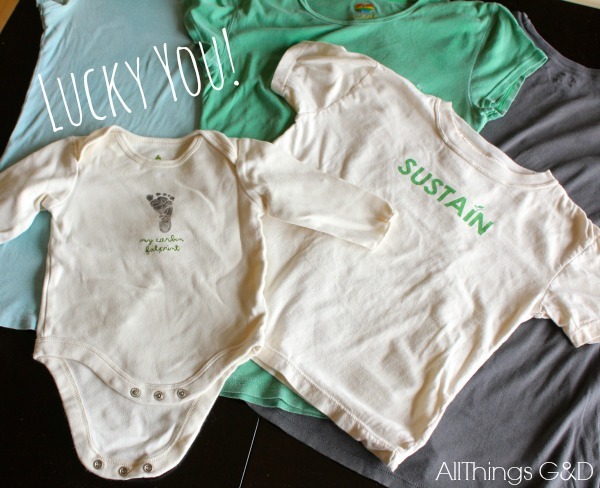 T-shirts and onesie pulled out of dark closet corners and about to get new life! Cut the top off your shirt. Turn it inside out and sew what is now the bottom of your bag closed. Use a rotary cutter (or scissors) to cut staggered slits through the fabric and a little handle at the top. 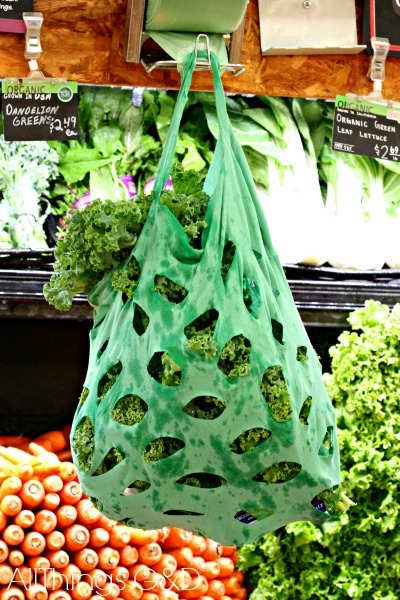 No more plastic produce bags for me! You’re welcome, Earth. 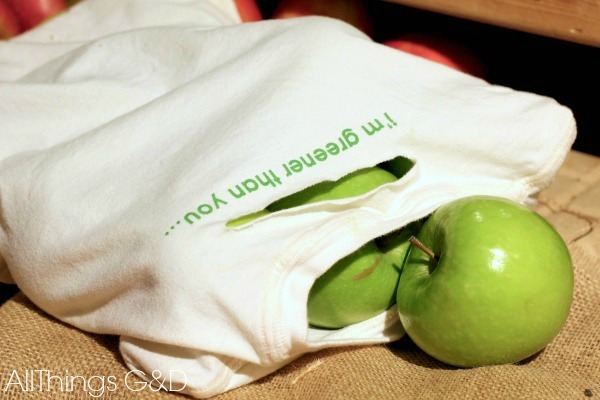 I started this project thinking I’d use the larger sized produce t-shirt bags the most, but much to my surprise, the smaller bags – like the one made from this size 4T shirt – are my favorite to grab! 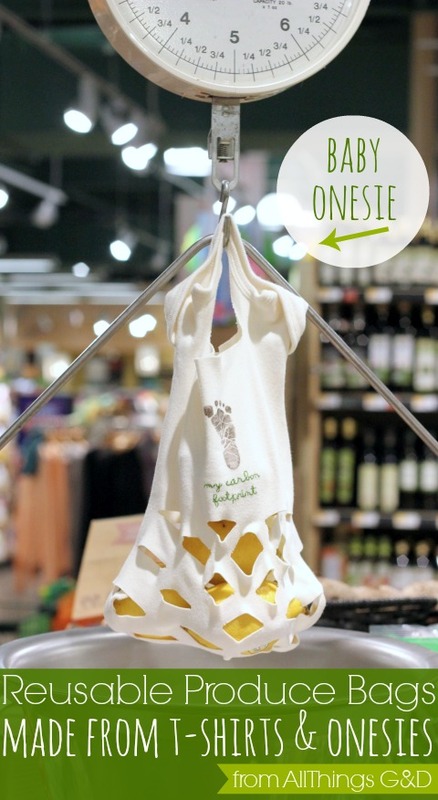 A 6 month onesie, upcycled into a reusable produce bag. Kate’s old onesie is now my favorite grocery shopping bag! I made this gray bag from one of my old t-shirts using the instructions at the top of this post, except I decided to skip cutting slits through it, so this one is more like a t-shirt tote. I love it for holding vegetables like sweet potatoes and carrots that would always poke through and shred those plastic produce bags. 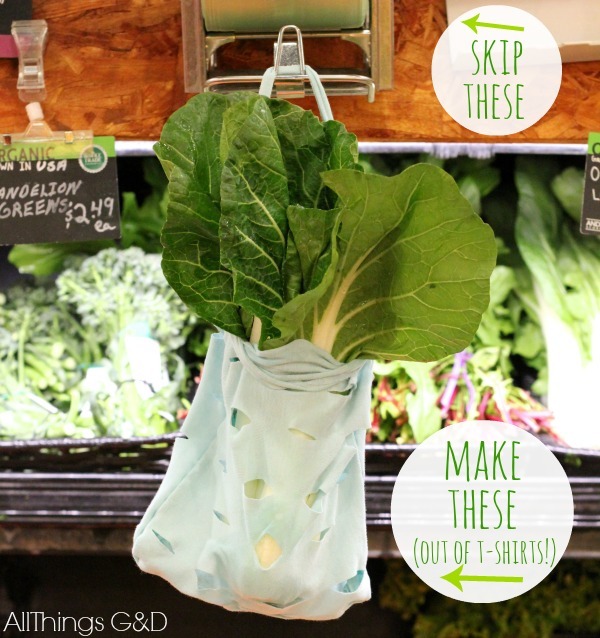 Sweet potatoes won’t be poking holes through THIS reusable produce bag! 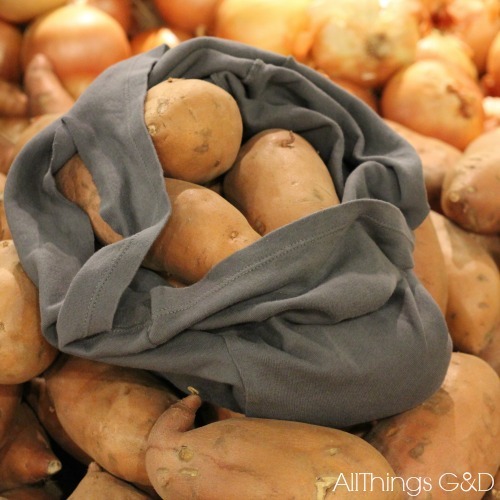 I love that I found a way to repurpose some of our old shirts, and I REALLY love that I’ll no longer be filling landfills with disposable plastic produce bags! Bonus? 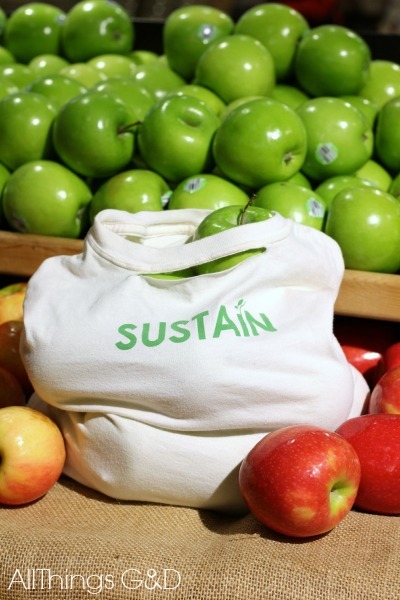 These reusable produce bags also qualify for “bring your own bag” credits at the grocery store – They help save the planet, and save you money on your grocery bill! 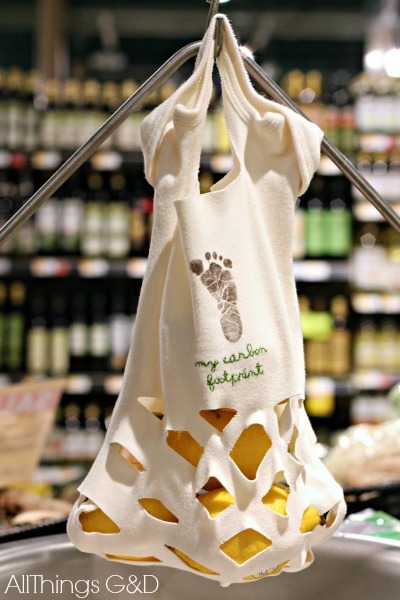 These reusable t-shirt bags help save the planet, AND save you money on your grocery bill! Like this repurposed project? Check out these other ideas from a few lovely ladies who also share a love of repurposing, recycling, and reusing! This is such an AMAZING idea! But what I’m really chuckling about is how you staged an awesome photo shoot at your local grocery store! Ha! Were the other shoppers looking at you like you were a crazy woman? LOL! LOL! Thanks Linda! (And thank you to my local Whole Foods Market, too!) I went during a less busy time of day and the other shoppers didn’t seem to mind. Most of them were super interested in the idea and wanted to find out more! I don’t have a sewing machine….but this makes me want one. Or more realistically, maybe it makes me want to send some of our old tops to you, along with a self-addressed, stamped envelope so that you could return some of these clever little bags to me. Thanks for thinking outside of the….bag? What a great idea this is! G, Kate, and I will be in Seattle later this month! I’m happy to make up some extra produce bags for you and hand deliver! Great questions, Julie! I made most of the bags using “tissue tees” which are really lightweight. I’ll weigh them the next time I’m at the store to see how much more they’re adding – that will be interesting to find out! My grocer actually took the items out of my heavier t-shirt bags (the sweet potatoes and lemons) and weighed them without the bag, which was nice. I also got a discount on my groceries for each bag I brought in, so that helps offset my total bill. I’ll keep you posted on what I discover with the tissue t’s! These are great and I agree with Linda. I love that you photographed them in the grocery store. I bet you got some crazy looks! Ditto jbhat! I don’t have a sewing machine, either (I imagine if I did, my husband would probably have me committed and my children would wonder where their polite, sweet talking mama went!). 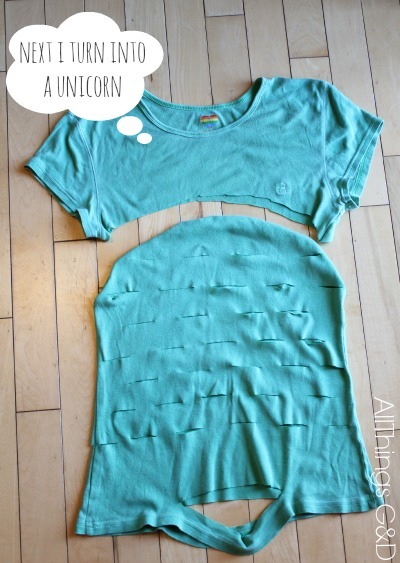 This is another awesome, DIY, reduce/reuse/recycle idea. And you (and all of Wisconsin) will likely be ashamed to hear this, but when I read your comment my initial reaction was, “Is that who we’re playing on Saturday?” I’m terrible with following sports, but I WILL be tuning in on Saturday to cheer Bucky and crew to a victory! EXCELLENT! I agree with Julie though, I wonder how the weighing goes? They weigh at checkout and I’m not sure what will happen with the t-shirt bags. They might have to empty them and then refill them? I’ll have to ask Publix next time I’m there. Great ideas though! Great points, Caron! I replied to Julie above, but I’ll post it here to in case you’re not following comments. I made most of the bags using “tissue tees” which are really lightweight. I’ll weigh them the next time I’m at the store to see how much more they’re adding – that will be interesting to find out! My grocer actually took the items out of my heavier t-shirt bags (the sweet potatoes and lemons) and weighed them without the bag, which was nice. I also got a discount on my groceries for each bag I brought in, so that helps offset my total bill. I’ll keep you posted on what I discover with the tissue t’s! 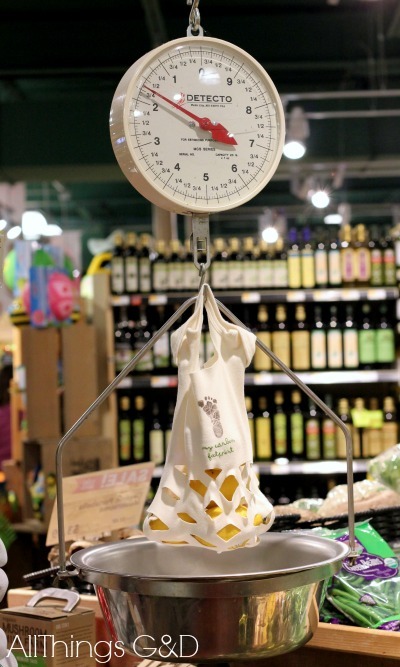 I was going to ask the same as some of the other folks; how does it work as far as weighing goes? That’s always been my concern with reusable produce bags. Hi Kate! I replied to Julie and Caron above, but I’ll post it here, too, in case you’re not following comments. I made most of the bags using “tissue tees” which are really lightweight. I’ll weigh them the next time I’m at the store to see how much more they’re adding – that will be interesting to find out! My grocer actually took the items out of my heavier t-shirt bags (the sweet potatoes and lemons) and weighed them without the bag, which was nice. I also got a discount on my groceries for each bag I brought in, so that helps offset my total bill. I’ll keep you posted on what I discover with the tissue t’s! This is such a great idea! 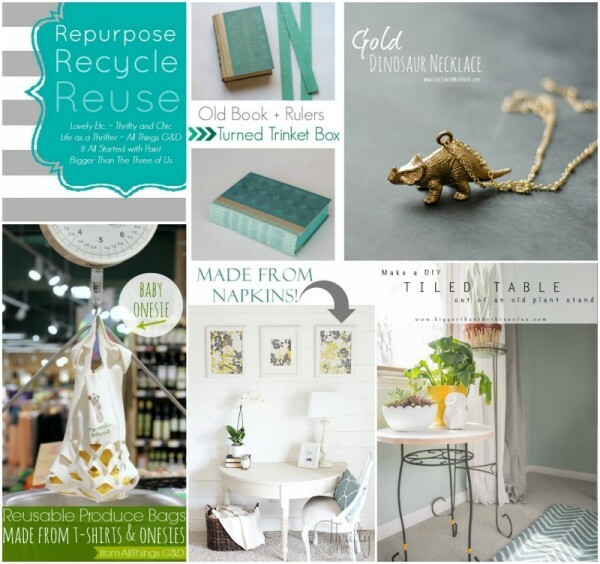 You get to reuse stuff you don’t need and help prevent landfill junk all at the same time. And extra bonus points because they are so cute! Love this. Thank you so much, Carrie!